GRETSCH manufactured the ROUNDUP MODEL 6130 between 1954 and 1960. 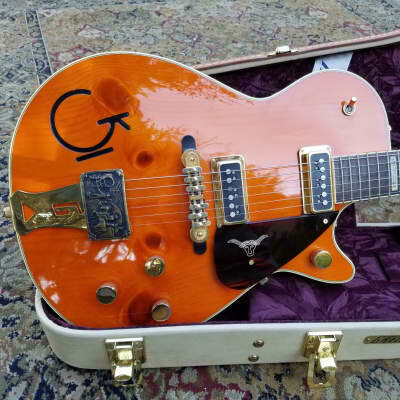 The Gretsch 6130 was a variant of the Gretsch Chet Atkins 6121 but with a pine top or all mahogany body (unlike the maple 6121).From 1954 to 1956 the Gretsch 6130 had full cowboy credentials including the western fingerboard inlays, cowboy belt buckle tailpiece, "G" brand, and leather cowboy tooling around the body. From 1957 to 1960 these cowboy details were mostly gone. Take the GRETSCH ROUNDUP MODEL 6130 price survey. 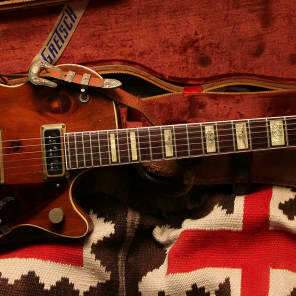 Gretsch 6130 Round Up 1955 "Knotty Pine"
Buy GRETSCH ROUNDUP MODEL 6130 electric guitars.